This popped up on my news feed as well. Hope the people who want to hear it get the chance. It's probably something that will get released after he passes. More likely 2021 if he decides to release. His vocals are much better than they are on ADKOT. I'll bet it's really weird with lots of guitar heroics, but I'd like to hear it before Dave dies! Have you heard DLR band? Great record, this is similar but more retro sounding ala wacf. Ah, thanks. I like the DLR Band music for the most part, but the vocals aren't a highlight. If Dave is more "Could This be Magic"-esque, this could be pretty great. You've heard it, or some of it? 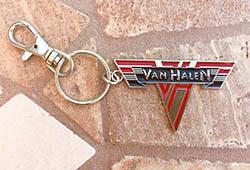 Van Halen collaboration with John Lennon? Who believes latest rumor from the DUMP? For the Record, who believes it will happen within 30 days? ?